For a quick, simple, and healthy breakfast in under ten minutes, try this Breakfast Quesadilla recipe. Heat a non-stick pan over medium heat and brush lightly with vegetable oil. Place the tortilla in the pan and pour the beaten egg, sprinkle chopped scallion, and season with salt and pepper. When the egg is almost set, top with a layer of cheese. Fold the tortilla in half, pressing down lightly with a spatula, and then carefully flip over. Cook until both sides are golden brown, crispy, and the cheese has melted. Slide the tortilla onto a plate lined with greased proof paper or paper towel. To serve, cut the quesadilla into 3 or 4 wedges. This is one of my favorite ways to eat breakfast! So easy, and has enough protein to hold me to lunchtime! Yum. 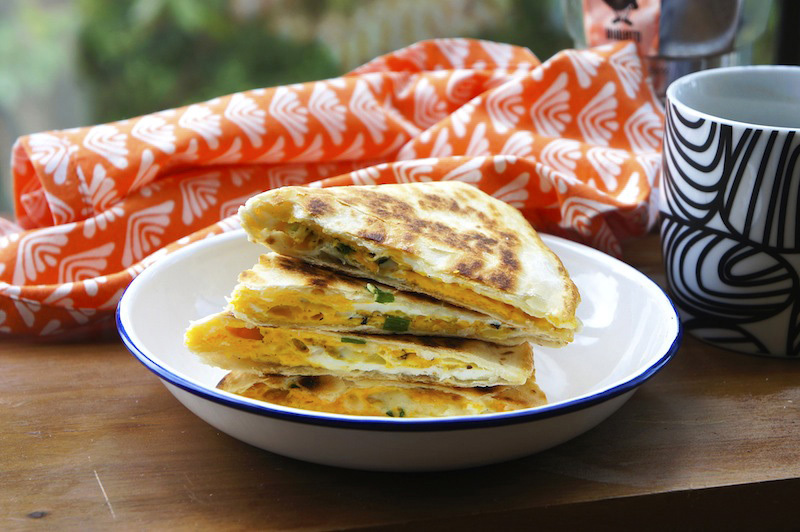 We had quesadilla for dinner last night but an eggy version would be great for breakfast. I bet avocado and tomato would also make nice additions (and bacon if you were that way inclined). Thank you for an excellent idea and also for skipping telling us a long story.